Twenty musicians traveled to New Zealand to create 10 new songs in just three weeks and we go behind the scenes in this fascinating documentary. 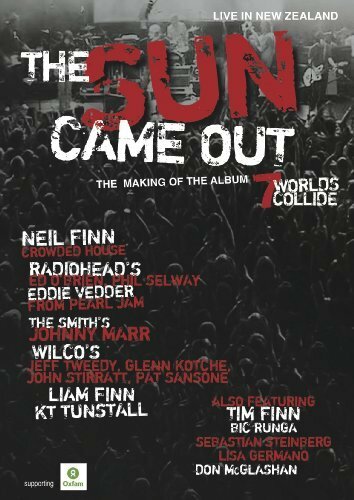 Coming together are Neil Finn, Johnny Marr, KT Turnstall, Radiohead and Wilco make an album with all proceeds going to charity. Simon Mark-Brown directed this look at a musical collaboration between these really exciting musicians who came together for a special cause. The event took place in 2008 on the west coast of Aukland and not only was an album recorded but the musicians performed three concerts. It is amazing to watch the song writing process and to see the camaraderie between them. Inspiring and intimate, this is something every music lover should see. The money was raised for OXFAM, an international association of 15 organizations working in over 50 countries to find solutions to poverty and injustice. This entry was posted in Film on April 30, 2012 by Amos.